Rebecca AmatoProduct Manager and chief dreamer of all things that make life easier. When our application directory Webex App Hub first debuted as the Cisco Spark Depot, the only way to add an application was to send us the details and we'd add it for you. Likewise, updating the details meant a request to our support folks, who would make the changes for you. Since that time, we've opened up access to let you manage the content for your own bots and integrations. Publishing an application is as simple as filling out some fields on a web form. We can review and approve new applications much more quickly, reducing the friction you experience when promoting your applications. This same self-serve content management lets you update applications you've already published. Say your App Hub description is looking a little dated because it still says it works with Cisco Spark or your screenshots don't match your application anymore. You can update it yourself by visiting the My Apps page and clicking on the app you want to change. Every App Hub content field shows up right on that page for you to change. For the most common changes, you can make them without any downtime or further review. Editing these fields will immediately update your App Hub listing. The other fields will require a review by Cisco before your listing is updated. During this review period, your App Hub listing will be removed. Fields that can be immediately updated are your Description, Tagline, the Redirect URL for Integrations, and your contact name and email. If you change one of the other fields, we will unpublish your application while Cisco reviews it. Your application will still work, but the listing won't appear on the App Hub until we approve the changes. If you want to minimze the time your application changes are under review, you can email your proposed changes to us ahead of time. Let us know what edits you're going to make and we'll let you know if you'll need to fix anything. 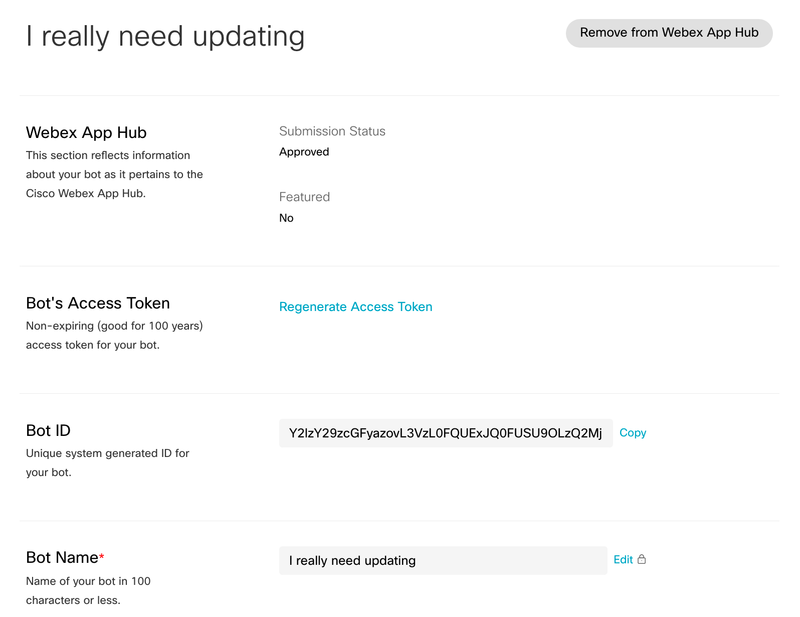 That way, when you make your App Hub edits, we'll be ready for them and can quickly verify your updates and re-publish your application. To take advantage of this option, email devsupport@webex.com with the list of fields you're changing and what changes you're planning on making.